Flower Tower Reviews - Too Good to be True? The Flower Tower is a gardening tool that can help to create a vertical tree-shaped garden of flowers in a few steps. First, assemble the tower together and make sure its standing vertically. Then insert the watering tube and fill it with water. The tube will dispense water equally, meaning that the Flower Tower is self-feeding and self-watering. Finally, fill the tower up with soil, fill it with plants that you can get from a nursery by inserting them into the holes, and watch as the Flower Tower turns into a pretty vertical garden thats covered with a variety of flowers. The infomercial claims that Flower Tower is the latest innovation in vertical gardening. 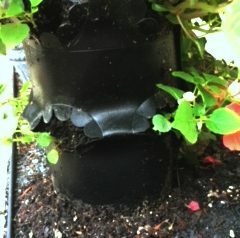 The infomercial says that the Flower Tower is three feet, is self watering, and self feeding, and can stand up easily. Assembly is said to be simple. First you put the tower together and then you put the watering tube inside of the base for the flowers to be watered, and then you put the soil inside, fill the holes with plants, and put the water inside of the tube. The watering tube is said to work by dispensing water evenly to all of the plants, making sure all grow at the same time. The cost of Flower Tower is $19.99 plus $9.99 shipping, for a total price of $29.98. This price was obtained from the As Seen on TV commercial page which was taken offline due to Flower Tower being discontinued. Flower Tower may still be found for sale on Amazon or Ebay. What Is The Flower Tower? The Flower Tower is a vertical gardening tool that can grow flowers from the various holes it has inside of it. The Flower Tower is easy to set up and is self-watering and self-feeding. When the flowers grow, it forms into a tree-like shape of beautiful flowes that look pleasing to anybody. In just a few minutes, you can set up the Flower Tower and have beautiful flowers of your own with ease. The Flower Tower just needs to be stood up, have its watering pipe installed, and filled with soil and water until you plant the plants or seeds in the holes. The Flower Tower works because of its watering tube. After putting the watering tube in and filling it with soil and plants, you can fill the watering tube up with water. The tube will dispense even amounts of water to each plant, meaning that it will feed itself without the need of having to water constantly. Just put the water in and it will be good to go for a while. The spacing between the holes also gives the flowers room, yet every plant combines nicely to form a beautiful tree of different kinds of flowers. Planting flowers can be troublesome. It can end up being a chore, especially by taking care of each one. Plus the space they take up can be annoying. By making a vertical garden, you can put everything in one space, taking up a whole lot less space and saving you time when it come to taking care of them. By self-watering and self-feeding, you dont have to worry about over and under watering your plants. Its easy to set up and will deliver you beautiful trees of flowers in no time at all. Its a vertical garden that allows you to plant many flowers in its slots for maximum space saving. Its self-feeding and self-watering, meaning that you dont have to do much taking care of them to get the beautiful blooms youve always wanted. Setting it up is easy. First stand up the tower, add the watering tube, fill it with soil, plant the plants, and fill the tube with water. 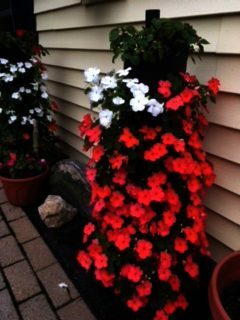 Beautiful flowers grow from the holes, forming a tree of flowers that looks good for any household. The tower is also self-standing. No worrying about the tower falling and destroying the flowers. Its three feet tall, meaning that the flowers show up nicely. Up to 30 plants can be combined for a great variety of things. Tomatoes, strawberries, and other fruits can also be planted, giving you a tree that you can make a salad with. The Flower Tower is a very useful invention no matter how you look at it. taking care of a garden can be a hassle, but with this its much easier and helps to save space, all while looking beautiful. The Flower Tower is recommended for new and pro gardeners alike. Do not buy Flower Tower online before searching Amazon. I did not have a problem assembling the tower. Planting the flowers were no problem either. If you follow directions, fill dirt to top of first row, then place plant thru holes, then fill with dirt to the second row and place plant and so on to top row. Do not fill entire tower with dirt & then try to plant. This could be difficult, one row at a time. My flowers are in full bloom & look beautiful. But, now i noticed the tower is buckling on bottom row this could be a problem if it snaps or break. Please see images attached. My daughter bought 2 Flower Towers for herself and 2 for me as a mothers day gift. This is the most ridiculous product, right upon assembly some of the connecting tabs broke off. My daughter is very handy and me too. I started to fill the tower. I realized immediately that I had to protect the tower in a plastic bag as not to loose the earth through the holes. I also wrapped the top part in plastic foil again, to prevent the earth from falling out while trying to plant. I received for flats of flowers. It was impossible to stuff them into the hole as the root ball was far too big. The pot was 2 inch. We did not realize we might have to use the small plug with small seedling, not readily available and not specified in the instructions which I wanted to verify on the www.buyflowertower.com site. No Luck, the site name is for sale and no info on the Flower Tower is available. This sheet of plastic material is probably also not food grade plastic and the edible plants could pick up unhealthy toxins. Very very disappointing product. The design in the package is different from the instructions that I received. The assembly is not that easy. I am having some problems in figure out how to clip the base. After assembly it still does not look like the above picture.